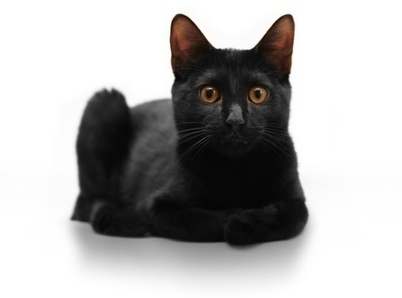 With 30 points of the standard given to color, the Bombay cat is black with a round head (25 points) and coat and body (20 points each) that is distinctive. Their eyes are gold to copper colored. The Bombay allows outcrosses to the black American shorthair and the sable Burmese, but always to maintain an individual color and characteristics unlike either parent breed. This is a medium sized cat that is normally friendly and outgoing. They should be well muscled and weigh a little more than they appear. Developed in the 1950s by the late Nikki Horner she sought to produce a domestic cat with the appearance of a black panther. Careful selection, outcrossing and inbreeding produced a black cat with the look she was looking for. This is a breed that can sometimes be leash trained and can be creative in finding their own entertainment. They are normally good with other animals and have an easy going nature. They are similar to the Burmese in many ways with a medium length of body. The head is distinctive and of course the defining color of the coat sets the Bombay cat distinctly different from the Burmese.